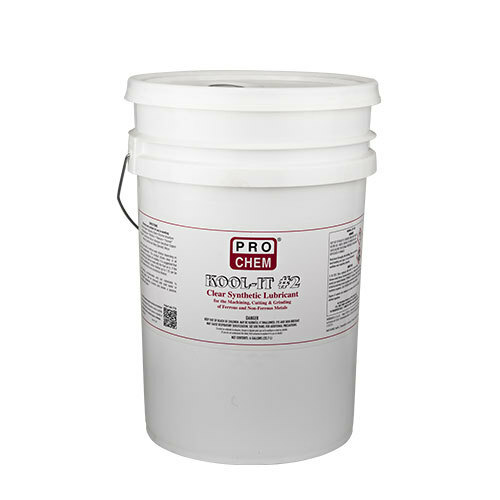 Kool-It #2 | Pro Chem, Inc.
KOOL-IT #2 is an all-purpose coolant that is very low foaming and extremely versatile. It remains transparent in all dilutions, an important quality when visibility is essential. This clear lubricant is designed for machining, cutting, tapping and grinding on all steels and nonferrous metals. It is fortified with rust and corrosion inhibitors. KOOL-IT #2 is highly concentrated and may be diluted up to 1:25 in most applications and 1:15 in more demanding applications. May be used with or without water dilution depending on the job requirements. This product dilutes clear in all proportions for complete job visibility. It is suggested that more difficult job trials be made with the fluid as is. If the results are satisfactory, further dilution up to 1:15 can be tried to determine the most economical dilution.